Memorial for Cameron King to be Held Saturday - Yo! Venice! Friends and family of Cameron King will host a “Celebration of His Life” tomorrow evening at the Melody Bar from 6-10pm. 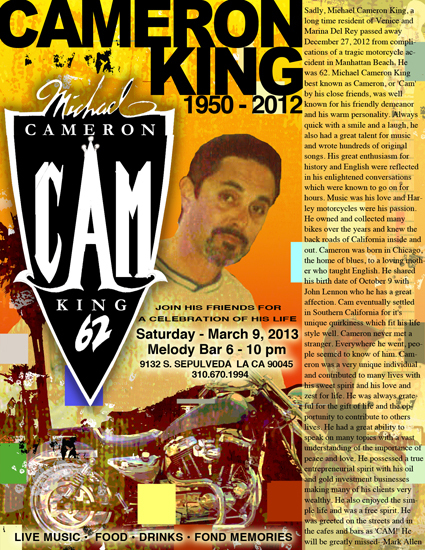 The evening will feature live music, food, drinks and fond memories of Cameron. King was struck by a Mercedes SUV while riding his motorcycle in Manhattan Beach at 4:28pm on November 1st of last year. The driver of the vehicle, Stephen Lee, was charged with vehicular manslaughter on February 28th. King was well known and well liked in Venice. RIP Cameron.